“I do my duty insofar as my powers and capabilities permit, until the moment when battle begins: I then leave the matter to God and the … subordinate officers. My supervision during the battle does more harm than good. It would be unfortunate if…I could not rely upon my division and brigade commanders. I think and work with all my powers to bring my troops to the right place at the right time; then I have done my duty. Lee’s response to arguments that he evacuate Richmond in the face of McClellan’s offensive against the city. REL to Mary Lee regarding the setting of the date for their wedding. Lee in a letter to President Davis proposing to enter Maryland. 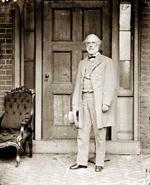 “General Lee is winning great renown as a great captain. Some of the English writers place him next to Napoleon and Wellington. I once excelled him and might have been his equal yet perhaps if I had remained in the army as he did. I sometimes regard his fame as a reproach to myself. “for he was not a man to stay idly behind defenses when there was an enemy about that he might hopefully strike. Sorrell, G. Moxley. Recollections of a Confederate Staff Officer. New York: Bantam edition, 1992.